To try the mPOWR Questionnarie now, click here. The mPOWR toolkit was designed to yield significant improvement in shared-decision making and engagement with providers and consumers in mental health treatment. The system was designed using evidence based measures of a consumer’s Quality of Life, the results of which would direct providers and consumers to review easily accessible decision aids designed to improve consumer motivation and increase access to community integrated social services. The mPOWR is intended to increase a consumer's understanding of their treatment options and to motivate the consumer to contribute their voice and participation in treatment progress. Ultimately the mPOWR Toolkit is intended to increase consumer functionality and track therapeutic outcomes of recovery. 1. 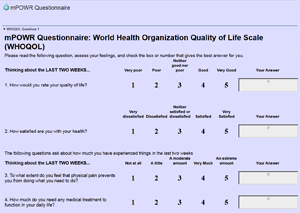 The mPOWR Questionnaire, an assessment questionnaire designed to assess quality of life and consumer functioning for use in the development of consumer-centered goals and outcomes. 2. An mPOWR Toolkit of care manager communication strategies, prompts, and decision aids designed to foster sustained consumer involvement in every aspect of treatment. An example of a communication strategy is asking at the beginning of each session how the consumer is doing in terms of identified care goals. 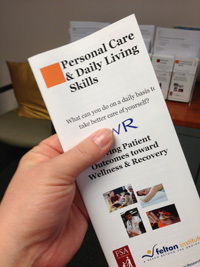 An example of a prompt is a chart note reminding the care manager to ask if a consumer feels they had the information needed to make a decision. An example of a decision aid is an information sheet that outlines the various service options and the risks and benefits of each option. 3. A comprehensive train-the-trainer model of training, coaching and supervision designed to ensure organizational, supervisor, and care manager commitment to mPOWR. Felton will provide supervisors with intensive training in the form of online and classroom courses, workshops, and seminars in addition to providing ongoing support, enabling organizations to provide mPOWR coaching and supervision to care managers once the initial training is complete. To learn more about the PCORI funded research study of mPOWR, please click here.